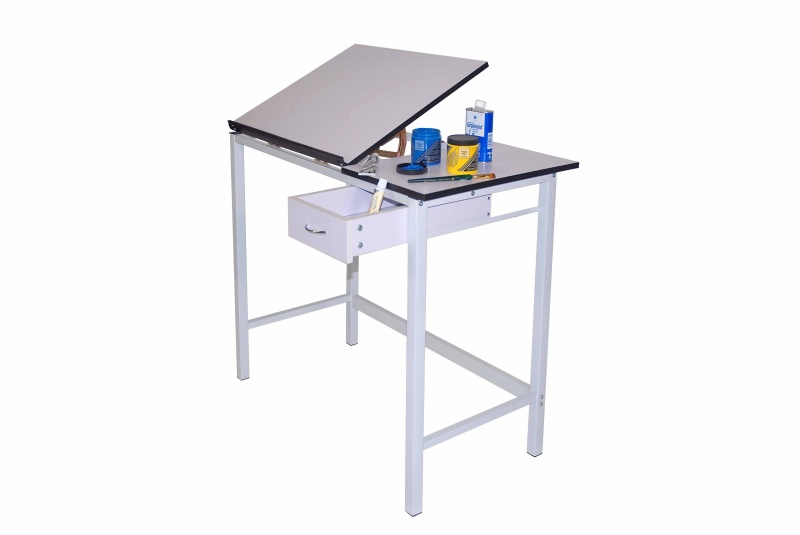 A very practical approach to a Drawing table with this Split-Top station. Easy adjust tilt top 20 x 24 inch with a fixed top section 12 x 20 inch offers great versatility. Handy Single pull drawer, 4-Post solid steel baked enamel finished construction. White unit with black edging trim and Pencil edge. Great for home, Schools, art drafting and hobby. The Manchester table is a split top with a 20" x 24" (ratchet style) tilting section and a 12" x 20" fixed top section. It has a heavy steel four-post construction with a white enamel finish. There is a single side drawer size 7 5/8" x 15 1/4 x 2 5/8".